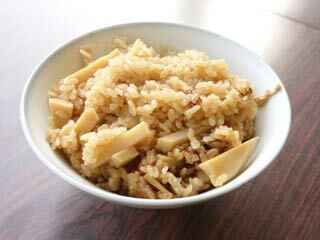 "Takenoko Gohan" (竹の子ご飯, 筍ご飯) is Bamboo Bowl. It is one of the popular spring food with a fresh bamboo. It use a rice cooker with all foods and flavors before steam rice. It is very easy to make and one of the best way to enjoy baby bamboo. Cut bamboo, first. Cut the top like this. Slice bottom again to make a small pieces. Put bamboo in a bowl. Peel off a skin and cut into 1cm piece. Like this. About the finger tip size, and put them in the bowl. Flavor bamboo and chicken with a half scoop of soy sauce. Then, add a half scoop of Sake. Aburaage has extra grease on it. Remove them by pouring with hot water. Hot water take all extra grease. Cut Abraage 4 times in a cross. and slice them into small pieces. Polish Rice (3 go, 3 caps). Add water little. Don't add too much water at this time. Adjust it later. Add soy sauce, a scoop. Add Sake, a half scoop. Add Mirin, little over a half scoop. Mirin makes nice crispy parts. Then mix them, and check out the taste here. The amount of water is the same as cooking normal rice. Put flavored bamboo and chicken, and no sauce. Put Abraage, don't mix them. It's finished. Check it out! This is the crispy parts.